Who owns this beautiful turquoise blue Nash automobile? We spotted this beautifully-restored Nash twice today — first parked on Santa Cruz Avenue near the farmers market and then being driven on Oak Avenue going west. 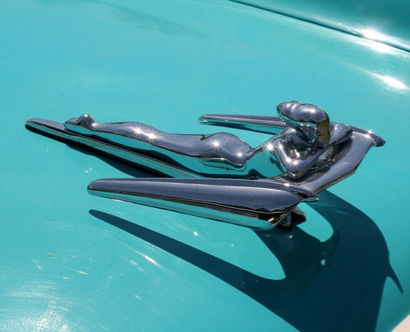 We are old enough to remember Nash automobiles in its later years of production, and think this one is a Metropolitan based on the hood ornament (right). “The Nash Metropolitan was an American automobile that was sold from 1953 to 1961. “It conforms to two classes of vehicle: economy car] and subcompact car. In today’s terminology the Metropolitan is a “subcompact”, but this category had not yet come into use when the car was made. At that time, it was variously categorized, for example as a “small automobile” as well as an “economy car”.